As many of you know a trip to K-Mart a while back landed me a '34 Goudey buyback of Baxter Jordan. dayf from Cardboard Junkie e-mailed me about trading it to him and I was willing to entertain trading it since it really didn't do much for me, other than look cool and end up a trophy pull from a blaster. 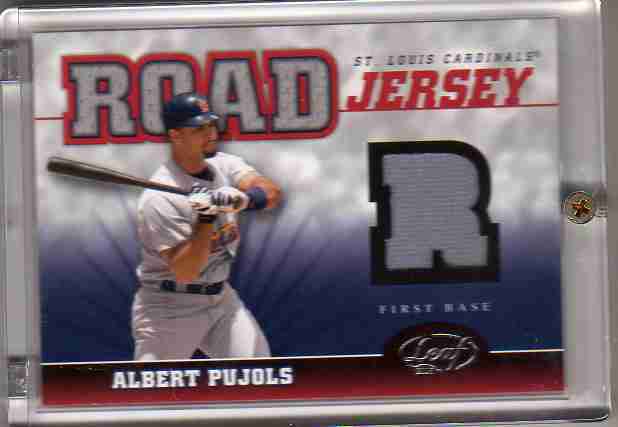 I was offered a boatload, and by boatload I mean over 40 YSL cards PLUS a Pujols GU jersey card for the '34 Jordan, some cards to help him complete a set and some Braves that he was interested in (at least I think that's how this went down). 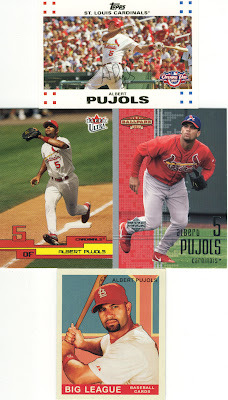 dayf was also kind enough to throw in some free Pujols cards that are making new friends here on my desk for now. Thanks dayf this trade got me a few centimeters closer to that far, far away finish line on the YSL set. P.S. I opened the 2009 Topps Series 2 packs and they were uneventful, which was more or less expected after the luck on the Goudey. Stay tuned.